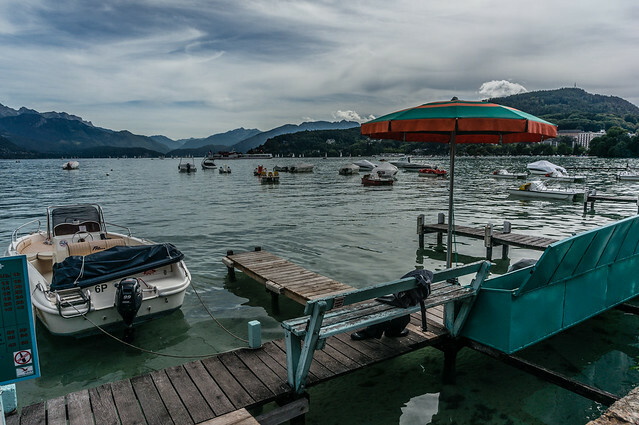 Most famous for its namesake lake and winding canals, Annecy’s charms are hard to resist. Most famous for its namesake lake and winding canals, Annecy’s charms are hard to resist. Its historic old town and lakeside promenade make for a wonderful place to amble around on a sunny afternoon. If it’s water-based activities you’re after, summer is undoubtedly the best time to visit. But wandering its old streets in the off-season you sometimes feel like you have the whole place to yourself. There is a free car park at the end of the lake which is a great starting point for a walking tour of Annecy. After parking up, you can take a leisurely stroll around the lake towards the old town. Looking out at the mountains surrounding the lake might conjure memories of how you would draw mountains as a child, stacking them one on top of the other as they get taller and taller into the distance. It’s a stunning sight. 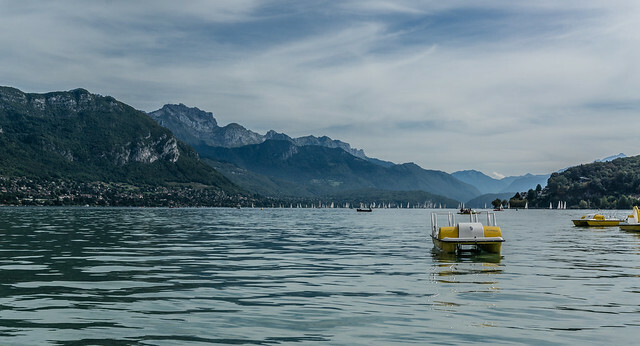 Pedalo, Lake Annecy, France, a photo by Flights. Camera. Satisfaction. on Flickr. If the sun is shining you can take a pedalo out onto the lake and relax on the gentle undulation of the water. And if you’re well prepared feel free to jump off and take a dip, the water is there to be enjoyed! There are large green areas all around the lake, so if you don’t fancy the effort of a pedalo you can simply lie down on the grass and soak up the sun. I’ve always thought it would be a great place for a picnic, but I’ve never done it myself. 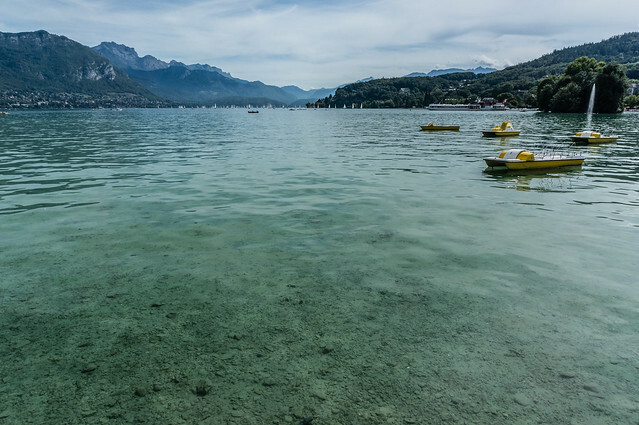 Lake Annecy, France, a photo by Flights. Camera. Satisfaction. on Flickr. If you follow the lake around, you’ll reach the charming old town of Annecy in about 20 minutes. The first thing you’re likely to notice is the Palais de l’Isle, probably the most photographed building in Annecy. Situated in between the two canals running through the heart of the town, its striking location and brickwork provide a stark contrast to the colourful townhouses surrounding it. Palais de l’isle, Annecy, France, a photo by Flights. Camera. Satisfaction. on Flickr. 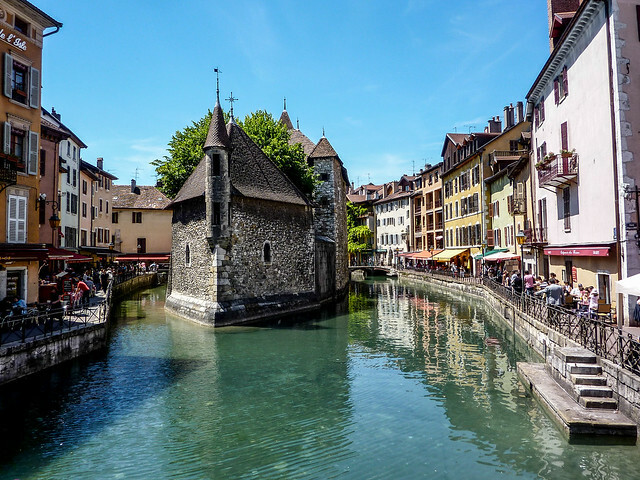 Built in 1192 it was first used as the primary residence for the Lord of Annecy, and then later the administrative headquarters for the Counts of Geneva as Annecy came under the control of the House of Savoy. Being surrounded by water the palace was deemed the perfect place for a prison throughout the middle ages and more recently during World War 2. In the present day it houses a museum detailing the local history. 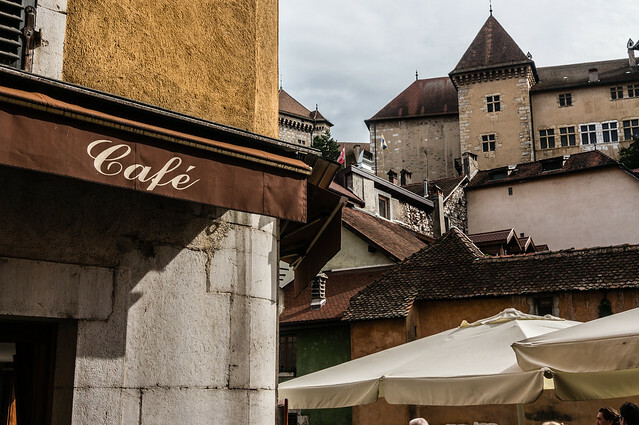 TCafe, Annecy, France , a photo by Flights. Camera. Satisfaction. on Flickr. By now you’ll have noticed the plentiful cafes and restaurants lining the canals on either side. If you like a crepe or Italian food then you’re in luck, because the bulk of the restaurants fall into these two categories. In amongst the tourist crowd you’ll hear the most French being spoken in the creperies, which are certainly most popular with the locals. So for the most authentic lunch time experience they have to be the number one choice. 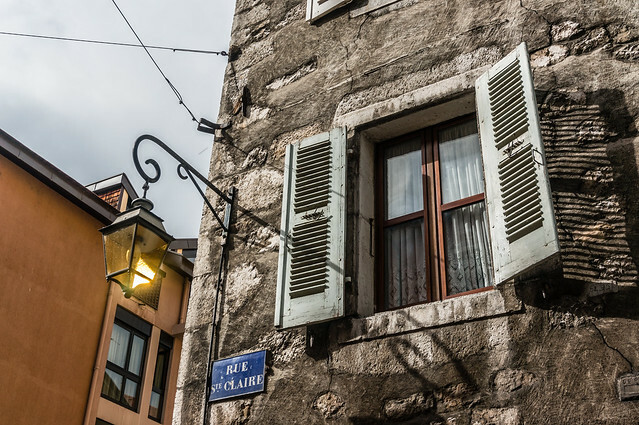 Window, Annecy, France, a photo by Flights. Camera. Satisfaction. on Flickr. Once you’ve finished your lunch, you can spend the afternoon getting lost in the narrow streets of Annecy’s old town. With artists and musicians around every corner filling the air with beautiful sounds it has a lovely atmosphere. The array of colourful buildings is fantastic, and on a still day there are some sumptuous reflections to be seen in the canals. Given its reputation as a tourist-centric destination, the quality of boutique shops on offer in Annecy is surprisingly high. There are some brilliant food stores stocking great local produce, and lovely independents selling hand made glass and table ware. 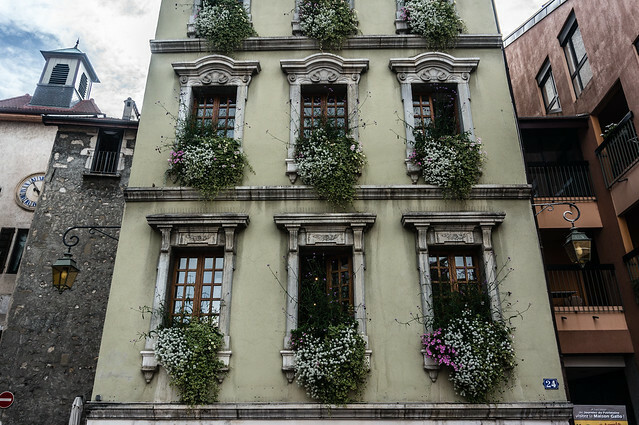 Decoration, Annecy, France, a photo by Flights. Camera. Satisfaction. on Flickr. I would really encourage you just to wander aimlessly in the old town and see what you find. Given its small size it’s really quite difficult to get truly lost. Alongside the Palais de l’Isle the other main attraction is the castle – Château d’Annecy. Originally built between the 12th and 16th centuries and located atop a steep hill, it affords some great views over Annecy and toward the lake. It’s a great way to finish the day before heading back around the lake toward your car and onward journey.